Homeowners tell us time and time again that the most important considerations for them when embarking on a loft conversion or extension are daylight and creating a sense of space. Recent research from VELUX suggests that these homeowners are becoming more active in the decision-making process of their projects, so giving them the natural light and space they desire is more and more important. Having solutions to this challenge will help you secure projects like these, which have an average worth of £25000!!! Roof windows let in up to twice as much daylight than a conventional vertical window and up to three times more daylight than a dormer window, so are ideal for maximising natural light. They also support the natural stack effect of ventilation by drawing fresh air up through the house using natural buoyancy and pressure difference. Of course, orientation will have a big impact on the availability and quality of daylight. Light coming from the north will, in many cases, be diffused light and will remain stable throughout the day, whereas light coming from the east, south and west will provide direct sunlight at some point in the day and the quality of light will vary significantly as the sun moves throughout the day. What impact does room function have? 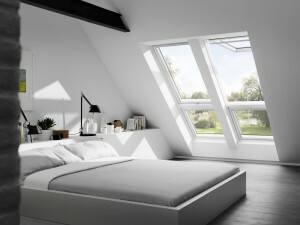 The type and quantity of roof window will also be key and VELUX have an unrivalled range. In the picture shown you’ll see a combination of roof windows, including white polyurethane top-hung to maximise the view from the roof as well as blend in with the modern interior. White Polyurethane are also ideal for humid interiors like kitchens and bathrooms, and require less maintenance than the natural pine finish. Interestingly, they are also fast becoming the roof window of choice for the Homeowners. For out-of-reach windows and blinds don’t forget the INTEGRA electric range, these come with a touch screen control pad and rain sensors as standard. All VELUX windows offer a variety of glazing options too, meaning whatever the room function or position of window there’s a solution to suit the homeowner’s needs.